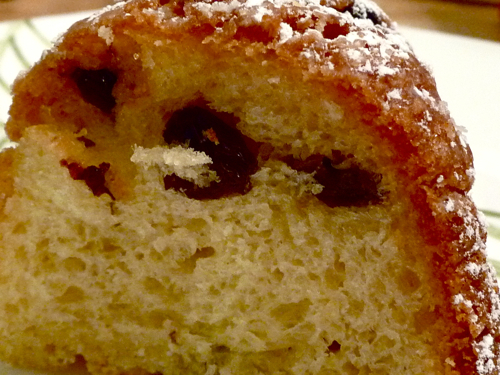 This week’s TWD recipe was an unusual one: kugelhopf. Sounds German, but it’s not (at least, not technically). Dorie tells us it comes from Alsace, in eastern France (but on the German border!). We were going to a party on Election Night, and I was supposed to take food that represented the home cities/states of the candidates. Chicago was easy: Peter Reinhart’s deep-dish pizza. But Delaware proved tougher. And then I worked it out: The du Pont family was a huge influence in the development of Delaware, and where were they from? Bien sur! So I made it for the party — we didn’t need all that quickly staling bread around here just for us. It was pretty easy to make, but it did rise slowly. At one point I was worried it wouldn’t come out of the oven in time, but all was well. I loved the finishing touches: brushing the loaf with lots of butter, then sprinkling it with sugar. The sugar melted to form a lovely, very thin crust. Right before I served it, a couple of hours later, I sprinkled it with confectioner’s sugar. I had one bite of Husband’s piece, after I photographed it. When I came back into the kitchen 10 minutes later, the whole loaf was gone. Husband: It was a good sweet bread. Not that memorable. #1 Son: I was expecting something with more flavor. I was expecting something more cakey, and because of that, my impression was negative, but as bread, it was good. #2 Son: I didn’t think it would be like cake, so I loved it. I liked the raisins. It was basically a sweet challah, but not sweet enough for me. I like my bread to be bread and my cake to be cake, and this was really a cross between the two. If you want to see what the other TWD bakers did with it, check out the blogroll. And if you want the recipe for yourself, buy Dorie’s book or check out The All-Purpose Girl. This entry was posted Tuesday, November 11th, 2008 at 8:00 am	and is filed under baking, bread, Dorie. You can leave a response, or trackback from your own site. great job. thanks for baking with me. I agree, this was not intensely flavored…and yet it disappears! Yours looks great. I like the France/du Pont/Delaware tie-in! We thought it tasted so good, but I didn’t like the time it took to make it. Oh, yours looks so beautiful…no wonder it was gone in a flash…who could resist. The outside and the inside must have been as divine as they look. Great job. We really liked it around here! 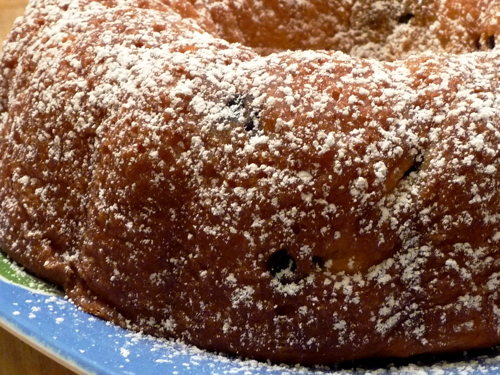 Your kugelhopf looks fantastic. Mine took forever to make. This was good, but I think Dorie owes me about 16 hours of my life back.